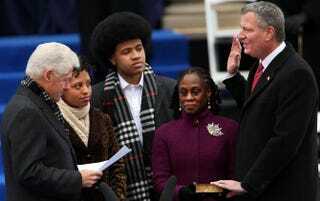 Bill de Blasio is sworn in by former President Bill Clinton as his family watches. Surrounded by his family and former President Bill Clinton, Bill de Blasio was formally sworn in as the 109th mayor of New York City, making him the first Democrat in two decades to hold the position of governing the nation's largest city, the New York Post reports. De Blasio, a former City Council member, assumed control of the city during the inauguration ceremony, which was held on the chilly steps of City Hall in Lower Manhattan. He reassured the crowd of 5,000 gathered that he would fight economic inequality in the city. "Our city is no stranger to big struggles—and no stranger to overcoming them,” de Blasio declared. "New York has faced fiscal collapse, a crime epidemic, terrorist attacks, and natural disasters. But now, in our time, we face a different crisis—an inequality crisis. It's not often the stuff of banner headlines in our newspapers. It's a quiet crisis, but one no less pernicious than those that have come before." De Blasio assured the crowd that he planned on moving fast, telling his audience, "We won't wait. We will do it now." De Blasio may want to slow down a bit, after the Bible used during his swearing-in went missing. According to the New York Post, the Bible used by the mayor during the ceremony vanished shortly after the event, sparking panic and an hours-long search for the historic tome. President Franklin Delano Roosevelt was given the Bible as a gift at his first inauguration in March 1933. Around 2:30 pm, the Bible was nowhere to be found, a source said, sparking a massive hunt at City Hall. "They had the whole detail looking through blankets," a police source told the New York Post. At least 50 NYPD detectives and city officials scrambled to find the Bible. "We were looking in garbage cans outside, in all the bags," one searcher told the New York Post. Just before 5 p.m., a detective stood at the top of the stairs in the rotunda shouting, "We found it!" The New York Post reports. A de Blasio spokesman declined to comment. The New York Post contacted the FDR Presidential Library to find out how, exactly, the Bible went missing but their calls were not returned.